Yesterday I went to Thirunavaya, in Malappuram, to do shrardham for my mother. It was a great experience. Thirunavaya is the abode of the gods and it impresses one with its breathtaking natural beauty. On the banks of Nila or Bharatapuzha, a 203 km long river, the second longest after Periyar, we have three glorious temples, dedicated to the Creative, Preservative and Destructive aspects of Time Eternal ! Hindus do srardham or bali ( rites to the departed ) , that is respect those who have gone to the astral plane. We respected the dead ancestors and prayed for forgiveness for the offences, knowingly or unknowingly, done to them. I am my brother did it for almost forty minutes, on the banks of the sacred Bharatpuzha. 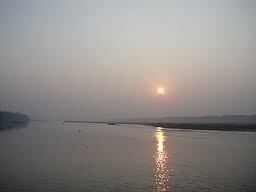 Bharatapuzha comes from the Western Ghats and flows through Kerala and drains itself into the Arabian Sea. It irrigates thousands of acres. Above is a video about the lotus cultivation in Thirunavaya. ( This temple deity, Lord Vishnu, was the Tutelary Deity of the Zamorin, who then was the ruler of Kerala. He was worried about the idols which were lost in the Bharatapuzha River. Astrologers advised him to garland Lord Vishnu with the lotus flower and hence lotus is cultivated on 250 acres. The lotus thus obtained goes not only to this Nava Mukunda temple but to temples like Guruvayur also). Millions come here because of the natural beauty, the greenish landscape architecture done by Nature and the proximity of the three temples dedicated to Lord Brahma, Lord Shiva and Lord Vishnu. Thirunavaya is a must see destination in Tourism Kerala. It lies 8 kms south of Tirur. The famous Nava Mukunda Temple lies on the bank the of the second largest river in Kerala, the Bharatapuzha. It is believed to be 6000 years old. The sanctum sanctorum is adorned by great sculptures which defiy imagination. You can see the mythological Ten Incarnations of Vishnu along with the story of Lord Shiva in his tribal avatar, blessing Arjuna with the Pasupatha Arrow. A place of immense historical importance, this is the ancient land of Mamankam, where the rulers used to assemble once, in every 12 years. One of them used to be elected as the Emperor of Kerala. There was a great Trade Fair held at this venue. Traders used to come in ships and barges and this festival was celebrated with great pomp and pageantry. This temple has a ten day annual festival starting with Kodiyettam and ending in Arattu. Lakhs of people visit this temple during the festival. 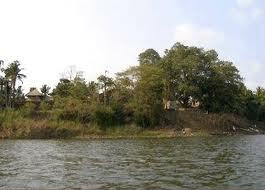 The famous Vedic Othanmar Madhom, is on the bank of Bharatapuzha, near the Lord Shiva temple. This institute was a center of Aryanisation thorough Vedic Knowledge and Sanskrit and Thirunavaya is believed to be the main center, where Parasurama,one of the Ten Incarnations of Lord Vishnu, brought and settled Brahmin scholars. All districts of neighbouring Tamil Nadu and Kerala are connected to Tirunavaya by an efficient system of roads. The National Highway 17 is the most notable. Malappuram District, where Tirunavaya is posited, has two railway tracks running through it. The Mangalore-Madras and the Nilambur-Shornur tracks. Both are well connected to other cities. Today, 230717, the Moon and Sun are conjunct in Cancer, ( Karkitaka Vavu, New Moon in Cancer ), as informed by our astro software. Thousands throng to Thirunavaya, Aluva and other places to do Pithru Tarpana. Pithru Tarpana process is both psychological and spiritual. We may have hurt our parents, knowingly or unknowingly. So we beg forgiveness from them and the Lord. and then pray for forgiveness from our ancestors & the Lord. True repentance is to cease from sinning ! Q - Which are the SIx Seasons of India? The Twelve Lunar Months start from Chaitradi, based on the Equinoctial New Moon. Two lunar months make a Season, Ritu. Kerala's Romeos and Juliets again ! Or hail it as an experience divine ? Reveal thyself, O Queen Regal !